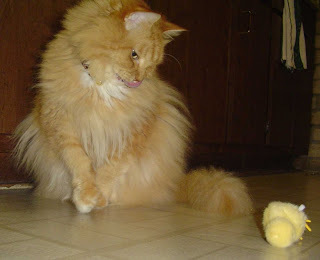 My most favorite blog kitty, Laurence Simon's Frisky, is gone. I loved watching all his kitties, catcams and still pictures, and he's lost 3 of the 4 in 2 years now. Please check out the photo gallery for memories of Frisky, and stop by IFOC for condolences. 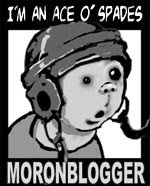 Hey, hey...I better start seeing some new kittehs hit the blogosphere. Remember, you're not replacing kitties, you're bowing before that whole...Disney...cycle of life thing. Uncle B and I met the fattest cat I've ever seen in person in a shop a couple of weeks ago. Name of Norman. He's seventeen, mostly white with a gray patch on his head (or a grey patch, considering he's British). And brown stripes down his flanks. Brown stripes? "He scorches his fur on the heater," his owner said. Sure enough, he was stretched out in front of it and hot to the touch. Her other cat had died the month before, and they got suckered into taking FOUR kittens in. Sadly, we didn't see the kittens.